The Vegas Golden Knights are required to draft at least three goaltenders in the 2017 Expansion Draft. While there will be a number of goaltending options available to the Golden Knights, some may be too risky of picks for both the inaugural season and future of the franchise. 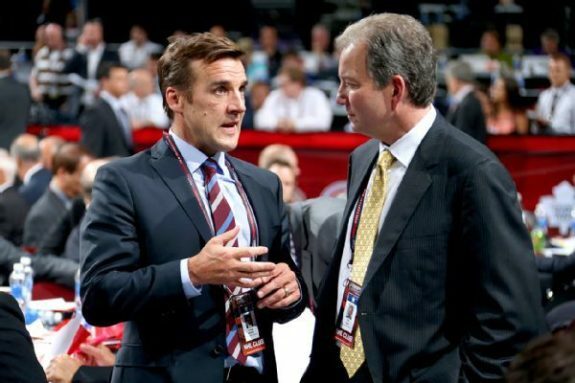 Until teams announce which of their goalies will be exposed, Golden Knights general manager George McPhee and front office management will have to review every potential option. Thus far, the only goaltenders that are known to be unavailable are Sergei Bobrovsky (CBJ), Corey Crawford (CHI), Cam Talbot (EDM), Carey Price (MTL), Pekka Rinne (NSH), Henrik Lundqvist (NYR), and Marc-Andre Fleury (PIT) — unless any of those goaltenders waive their no-movement clauses (NMC). It can be assumed that starting goaltenders without NMCs, such as Jonathan Quick (LAK), Devan Dubnyk (MIN), and Braden Holtby (WSH), will be protected as well. The Golden Knights’ Expansion Draft selections’ total cap hit must equate to at least 60 percent of the 2016-17 salary cap ($43.8 million). Teams often look to invest a significant portion of their salary cap in their goaltender. Many of the goaltenders that will be exposed carry considerable contracts, which has to factor in the Golden Knights’ selections. Although it has not been established which goaltenders will be made available to the Golden Knights yet, it can be speculated that there will be a number of sensible options made available to the Golden Knights. It is expected that a number of teams will look to unload unfavorable goalies to Vegas — whether it is goaltenders that appear to be fair options based on their past achievements, ones that are injury-prone, have inflated contracts or are inconsistent performers. Colorado Avalanche goaltender Semyon Varlamov had season-ending groin surgery in late January. If backup Calvin Pickard can prove himself during his time as starting goaltender with Varlamov out, the Avalanche could see more value in protecting Pickard­­ and expose Varlamov. Avalanche GM Joe Sakic recently expressed the team’s belief that Varlamov will be “fully healthy next year” and that he can return to “where he once was.” After excelling with the Washington Capitals, Varlamov was traded to the Avalanche in July 2011. Initially, Varlamov succeeded with the Avalanche, until the condensed 2012-13 season. Since then, not only has Varlamov faced a number of injuries but the team in front of him struggled. Varlamov’s injuries are concerning, many of which were related to groin and hip issues. Ideally, this surgery will solve those groin issues for Varlamov, who has been plagued by those injuries in recent seasons. Since the Avalanche are not contenders (sitting last in the league with 37 points through 60 games), shutting Varlamov down for the season to ensure he is ready for next season is the best decision. It also gives the Avalanche the opportunity to explore their other goaltending option of Pickard. The Golden Knights have the challenge of deciphering how much of Varlamov’s struggles have been due to the team in front of him or his poor play. Prior to his surgery, Varlamov appeared in 24 games (6-17-0) for the Avalanche, with a 3.38 goals-against average and .898 save percentage — the lowest of his career. The Avalanche have clearly struggled all season, but the goaltending has not been stellar either. Varlamov’s struggles could have stemmed from his groin issues, but it has to be questioned if Varlamov is worth the risk. 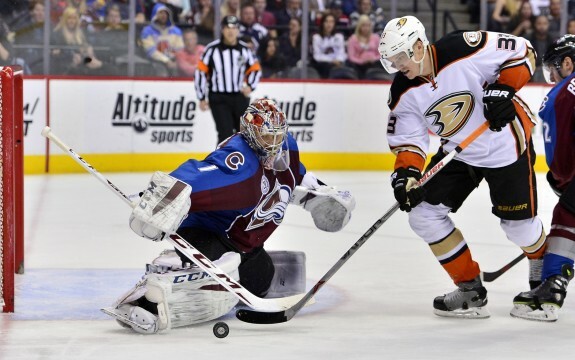 The 28-year-old netminder is in the middle of a five-year, $29.5 million dollar contract with the Avalanche. With an annual cap hit of $5.9 million, dwindling numbers, and injury issues (that may be solved, but are still something to be cautious about), it seems that there is too much uncertainty with Varlamov. Although Varlamov can be a great goaltender, a new team in an unconventional market could use more stability and success­ — which is undetermined that Varlamov can still bring. The Carolina Hurricanes traded for Eddie Lack from the Vancouver Canucks after the 2014-2015 season. Lack assumed the starting role in Vancouver when starter Ryan Miller was injured. In his 21 appearances in Miller’s absence, Lack was 12-6-2. Lack joined Carolina’s Cam Ward in net for the 2015-16 season and neither impressed. However, Ward’s record improved in the second half of the season, earning him a contract extension with the Hurricanes even though it appeared they were looking to phase Lack into the starting position after trading for him. This season, Lack has only appeared in eight games, with a record of 2-3-1. Lack’s GAA in those seven games is 3.26 and his Sv% is .884. Unfortunately, Lack suffered two concussions this season, shortening his dismal season. After a conditioning stint in the American Hockey League, Lack returned for the Hurricanes. Now that Lack is healthy, he could battle and potentially take the starting position from Ward. In 48 appearances (21-19-7), Ward’s GAA is 2.65 and Sv% is .904. The Hurricanes previously considered moving in a different direction from Ward, so if Lack can prove himself the rest of this season, he could be protected by the team leaving Ward exposed. However, if Lack’s play does not improve, the Hurricanes may prefer sticking with Ward. If Lack’s place drastically improves and the Hurricanes still insist on protecting Ward, then he should be reconsidered as a more viable option. Either way, it seems like Ward and Lack are both high-risk options for the Golden Knights. Ward could provide a veteran presence for a younger goaltender, as a Conn Smythe Trophy winner and Stanley Cup champion. And Lack could be a useful backup goaltender for the Golden Knights. Neither, though, are extraordinary starting goalie options in the expansion draft. 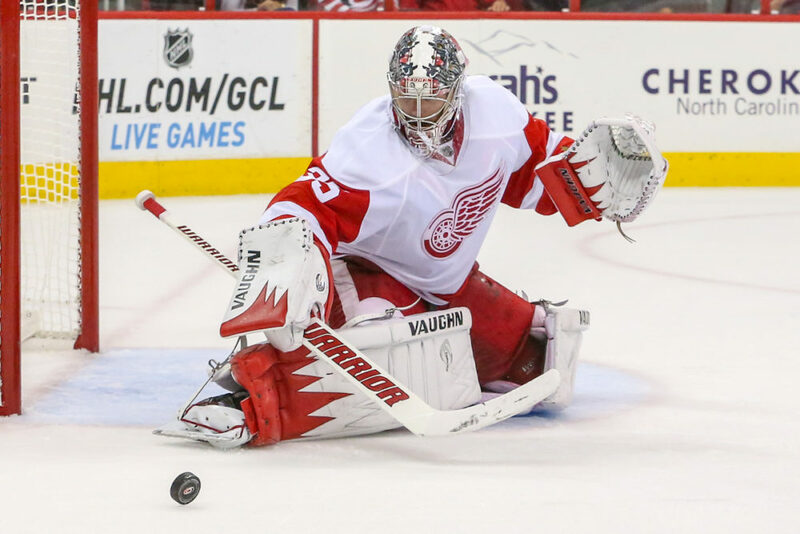 Jimmy Howard may have had a strong start to the season prior to his MCL injury, but he is still the most likely choice to be exposed to the expansion draft. Although Howard was playing well prior to his injury, he is not an ideal choice for the Golden Knights. Howard, 32, would provide the Golden Knights with an experienced, veteran presence. Additionally, Howard has experience playing behind a team with low goal support, which could be important for a new team that may not have chemistry immediately. Having Howard as a veteran presence for at least the next two years (his contract extends through the next two seasons) gives the Golden Knights an opportunity to train a potential franchise goaltender. However, Howard’s play throughout has been inconsistent prior to this season. Howard cannot be judged solely on this season because it was a small sample — he only appeared in 17 games with a 5-7-1 record. When compared to his career numbers (2.43 GAA, .915 SV%), this season’s 1.96 GAA and .934 SV% up to this point, have been above average. Given Howard’s age, however, it shouldn’t be expected that he continues to improve his numbers this season and through the end of his current contract. Even more uncertain about Howard is his durability. He’s been injured numerous times and if the Golden Knights are looking to draft a starting goaltender to make the team as competitive as possible, it’s important to have a more sustainable goaltender. If the Golden Knights were willing to allocate a $5.2 million cap hit for each of the next two seasons for Howard, the expectation likely would be to have a $5.2 million caliber goaltender — and it’s uncertain that he can be that player. Jaroslav Halak was waived by the New York Islanders in late December, in favor of Thomas Greiss and Jean-Francois Berube. Greiss, who was set to be an unrestricted free agent after this season (currently under contract with an annual cap hit of $1.5 million), was extended three more seasons with a cap hit of $3.3 million. Since being waived, Halak has been playing for the Islanders’ AHL affiliate, the Bridgeport Sound Tigers. Last season, Greiss assumed the starting position for the Islanders after Halak was injured­­ and Greiss maintained that position when Halak returned for this season. After accumulating a record of 6-8-5 through 21 appearances for the Islanders, with a 3.23 GAA and .905 save percentage, Halak was demoted. Since his demotion, though, Halak has excelled with the Sound Tigers. The New York Islanders are more than likely going to expose Halak, making him an option for the Golden Knights. When contemplating Halak though, there are a number of concerns that have to be carefully analyzed — starting with the number of injuries he has suffered throughout his career. The Golden Knights need to consider the risk of drafting a goaltender that has been prone to injury, especially for a player that would be acquired to be the starting goaltender. The Golden Knights need to analyze Halak’s playing abilities. He shined as Team Europe’s starting goaltender during the 2016 World Cup of Hockey, without much defensive support. However, his play declined during the regular season with the Islanders. The Islanders did create an uncomfortable situation for their goaltenders, with a three-goalie system. The Islanders attributed that system to Halak’s injury history but intended to start all three goalies­­, creating unnecessary pressure for the netminders. While that could be a reason for Halak’s struggles, it may not be enough for the Golden Knights to put their faith in him. Of the high-risk goalie options, Halak may be the best one. This season with the Islanders may have been his worst, but his career statistics only point to this year and 2012-13 as disappointing seasons — which may be outliers in his career — giving Halak hope for next season. Halak has certainly improved while in the AHL, but that still is not enough to convince some that he’s fully bounced back, given that the difference in the level of play between that league and the NHL. With an annual cap hit of $4.5 million, it is absolutely a risk for the Golden Knights. However, Halak only has a year left on his contract, so if they do draft him, they will only have to assume the risk for one season. The Golden Knights have to select at least three goaltenders at the expansion draft. Between the starting goaltenders, backups and prospects, the Golden Knights will have a number of options. Their goaltending options depend on who is exposed, but nonetheless, they will have a number of skillful options, as well as a number of high-risk options. Any of these higher risk options could be drafted and excel with the Golden Knights. On the other hand, if that goalie does not meet expectations, the team would have too much of their salary cap dedicated to a liability in net. The Golden Knights may have select players through the expansion draft that will equate to 60 percent of the salary cap, but that does not mean it should be spent carelessly, particularly when addressing the issue of goaltending for the first-year club. A goaltender can make or break or a team, so it is imperative they are meticulous when analyzing their options. The Golden Knights need to create an identity for themselves which often starts with the goaltender­­ — the backbone of a team.